Every bedroom is decorated in a different and uniquely Caribbean color and style, all with king beds, fans/ac and view to the water. Two dining rooms, two decks and living room/TV room are comfortably furnished and appointed with unique artwork and carvings. 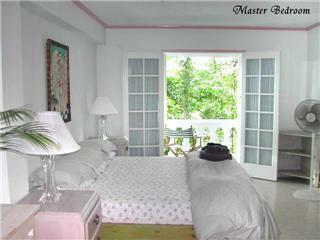 Moon San Villa can be rented per bedroom or take all 5 bedrooms. The staff at Moon San includes chef, housekeeper and bartender. 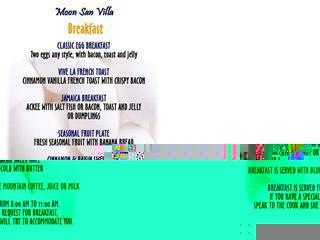 Breakfast (French toast/ fresh fruit plate/ salt fish and akee /or bacon and eggs + Blue Mountain coffee) is included in rates. 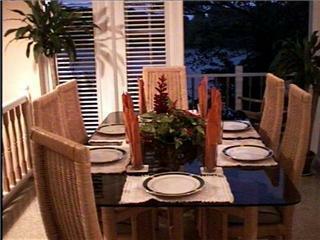 Breakfast or dinner is served in one of two dining rooms or on either deck or in your room. Delicious dinner entrees range from Chicken Francis to Jerk Chicken, and fresh lobster, snapper to crawfish soup. 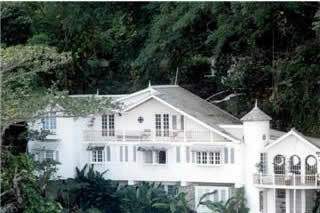 Prices range from US$15.00 to $35.00 per person. Ask the chef to prepare a special Jamaican dinner with fresh fish and local fresh vegetables. Just 300 ft. from the villa is the entrance to the Blue Lagoon. The lagoon is both fresh and salt water, and water temperatures are warm and cold, which makes swimming a whole new experience. Entrance to the Blue Lagoon is included. Entrance to Frenchman's Cove beach is included. On some days you might be the only couple. Three other white sand beaches nearby.